Brisket is a common cut of beef used for corned beef or barbecue, but is not considered a favored cut in terms of nutrition. The cut comes from the breast section, below the cow’s first five ribs. Even the leanest cuts of brisket contain more calories than other proteins lower in saturated fat. Consider the nutritional implications before adding 8 oz. of lean brisket to your diet. An 8-oz. serving of braised lean brisket contains 488 calories, according to the U.S. Department of Agriculture. Brisket has no carbohydrates, but offers 64 grams of protein in an 8-oz serving. The body can use only 30 grams of protein in one sitting for muscle synthesis, according to a study in the September 2009 issue of the “Journal of the American Dietetic Association.” You either excrete additional protein in urine or use it for energy. In 8 oz. of lean brisket, you get 24 grams of fat, of which 8 grams is saturated fat, a type that may increase your blood cholesterol levels if eaten to excess. The American Heart Association recommends keeping saturated fat intake to less than 7 percent of total daily calories. For a 2,000-calorie diet, you should consume 15.5 grams or less daily. Lean brisket provides many B vitamins, including riboflavin, niacin, folate and pantothenic acid. It also provides 5.6 micrograms of vitamin B-12, which helps promote energy and red blood cell health. The 6.4 milligrams of iron in an 8-oz. 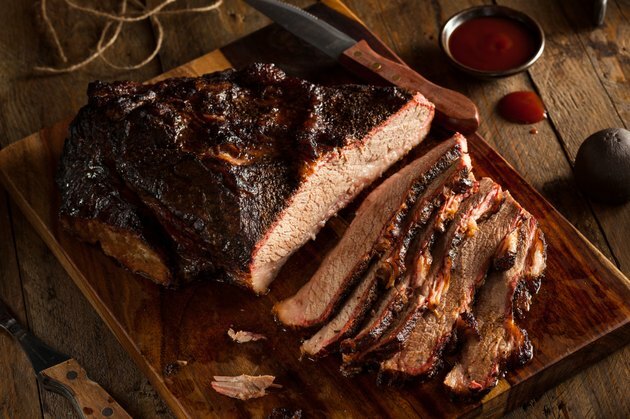 serving of lean brisket contributes to the 8 milligrams recommended for men daily and the 18 milligrams for women, as per Institute of Medicine guidelines. Iron helps red blood cells transport oxygen and is essential to good health. Lean brisket is also a source of several minerals, including phosphorus, magnesium, potassium, zinc and selenium. If you want to eat beef while keeping your fat intake to a minimum, choose tenderloin steaks, 97 percent lean ground beef or round steak instead of brisket. Because it is a tougher piece of meat, brisket tastes best when braised for an extended time. The Harvard School of Public Health notes that eating more than 18 oz. of red meat weekly could increase your risk of colon cancer.